This head-turning custom outdoor space added “backyard” appeal to this home in Lexington, SC. 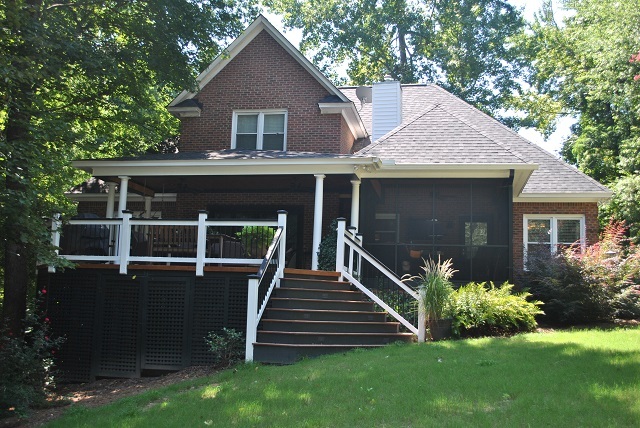 A grand entrance from the backyard onto this deck and covered porch combo in Governors Grant located in Lexington, SC. Our focus story this week takes us to the Governors Grant community located in beautiful Lexington, SC. When these homeowners contacted Archadeck of Central SC to inquire about increasing their outdoor entertaining space, what they got was much more than a lifestyle enhancement. 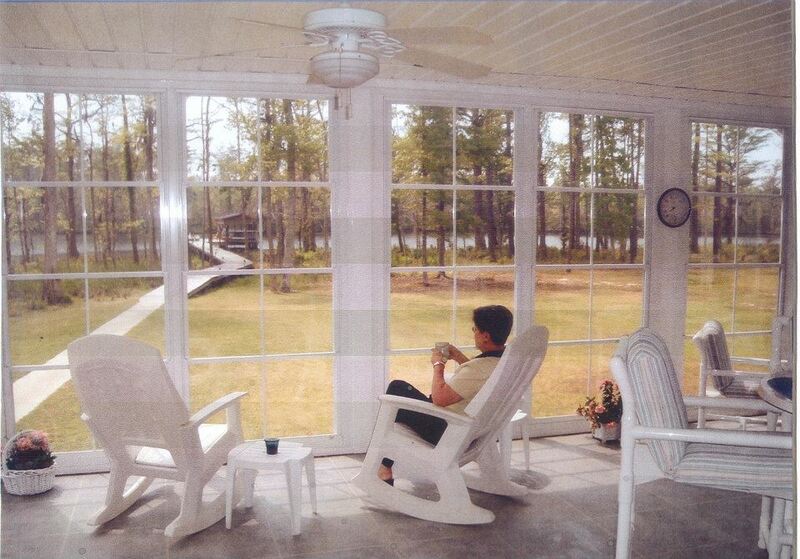 Prior to the addition, the only outdoor living space the homeowners had was a screened porch. Our outdoor living combination design took this backyard to a whole new level. In addition to the spacious and relaxing deck and covered porch addition, we also replaced the home’s existing rear bay window with convenient Pella doors. This made accessing the new outdoor area a breeze and unified the traffic flow of the new space with that of the screen porch. Bold colors and elegant details set this outdoor space apart. 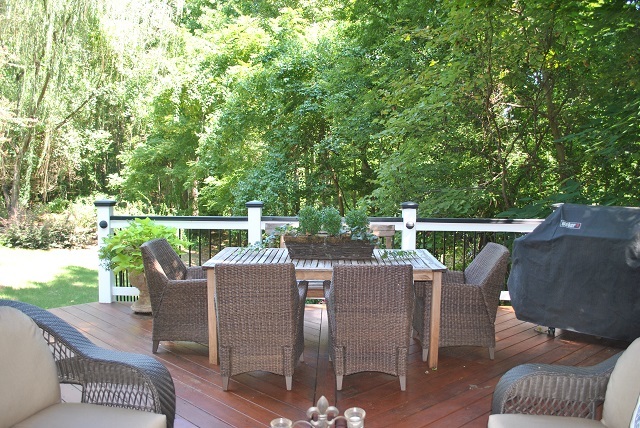 Deck detail in Governors Grant with separate area for dining. I recently had the opportunity to speak with the homeowners in regard to the outdoor oasis we built for them. It turns out, the homeowners recently sold their home. 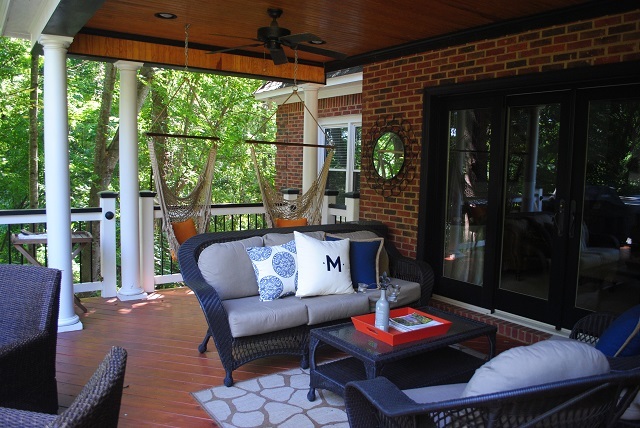 During our conversation, the homeowner pointed out “we enjoyed the deck and porch immensely during our time in the home.” He also indicated that the outdoor living space was one of the biggest selling points for the home. Their home sold in two days, during which time they were able to entertain multiple offers. They are glad they moved forward with the decision to make the investment in an outdoor living space. The homeowners’ flair for design also shone through in this project; the black and white details add to the elegance of the entire space. Adorned with majestic columns and a sweeping staircase, this deck and porch combination makes a bold statement adding to the beauty of this already stunning home! We want to wish the homeowners all the best in their new home and are humbled and proud to have been a part of enhancing their outdoor lifestyle for the better! This entry was posted in Archadeck of Central SC Customer Reviews and Testimonials, Custom Outdoor Living Designer & Builder, Decks, Open Porches, Outdoor living combination structures, Porches and tagged Archadeck of Central SC, Archadeck of Central South Carolina, Central SC combination outdoor living spaces, Central SC deck and porch outdoor living combinations, Central SC outdoor living combination builder, Central SC outdoor room additions, Central SC outdoor rooms, Central SC porch builder, Central SC porches, Columbia SC outdoor living combination designs, Governors Grant Lexington SC deck and porch combination, Governors Grant Lexington SC deck builder, Governors Grant Lexington SC porch builder, Lexington SC Deck Builder, Lexington SC open porch builder, This head-turning custom outdoor space added more than just curb appeal to this home in Lexington on August 29, 2014 by archadeckofcentralsc. Archadeck of Central SC customers confirm their satisfaction through our many positive customer reviews! We want to thank our customers for taking the time to send their feedback. James and Laverne in Irmo, S.C.
Mike, Marshall and Tucker Reu bring a modern approach to outdoor structures steeped in the quality craftsmanship of a by-gone era. 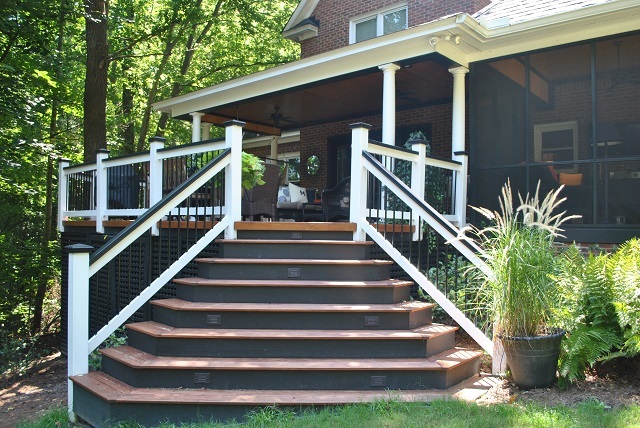 Since beginning Archadeck of Central South Carolina over ten years ago, we have become the area’s premier builder for decks, sunrooms and porches in the region. 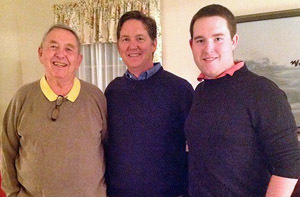 Our three-generation, family- owned company has created more than 400 outdoor living projects enabling our customers to take advantage of the natural beauty of Columbia, Lexington, Irmo, Florence and the surrounding regions, along with a mild climate we are fortunate enough to have almost year-round. Our outdoor spaces are designed with a keen eye for the holistic way homeowners now view their backyards with the goal of creating an outdoor escape. Our outdoor spaces are designed with a keen eye for the holistic way homeowners now view their backyards with the goal of creating an outdoor escape. We specialize in creating unforgettable outdoor structures with attention to the smallest details and quality you can see and feel! 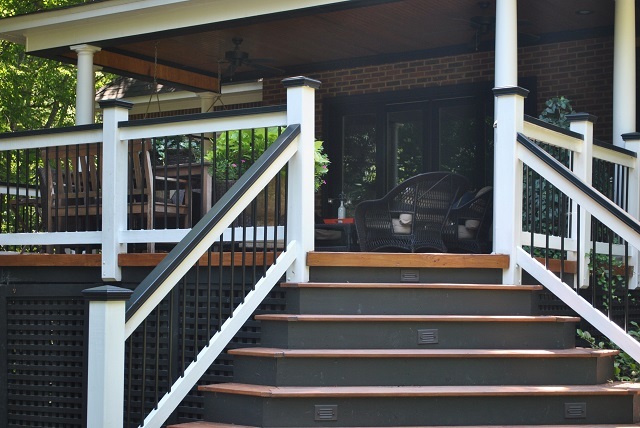 If you notice outstanding workmanship, or a one-of-a-kind deck or outdoor space here in the Central SC area, chances are, we’re behind the design! Contact us today to learn more about our customer-oriented philosophy to designing and building your ideal outdoor living space. You can call us at (803) 603-2160 or email us at centralsc@archadeck.net. Wanna hear more of what homeowners are saying about us? 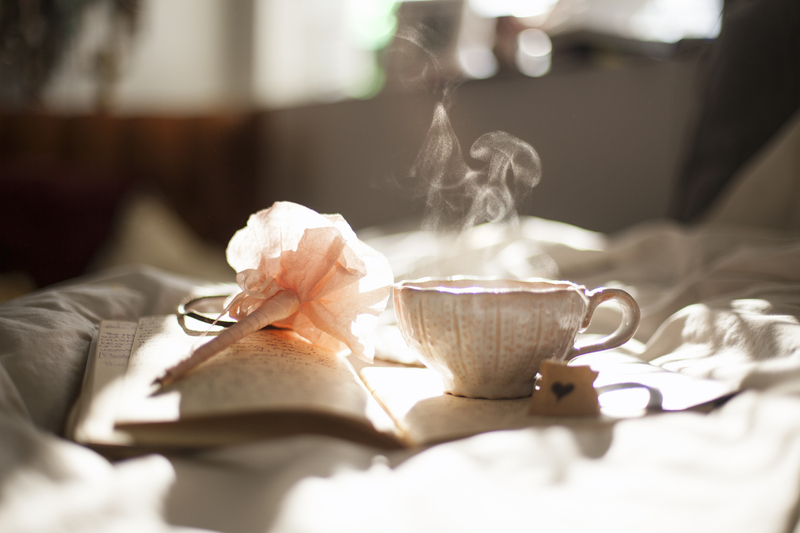 Read more customer testimonials by visiting our website today! This entry was posted in Archadeck of Central SC Customer Reviews and Testimonials, Custom Outdoor Living Designer & Builder, Outdoor living space design and building and tagged Archadeck of Central SC, Archadeck of Central SC customer oriented- approach to designing and building, Archadeck of Central SC Customer Reviews, Archadeck of Central SC customer testimonials, Archadeck of Central South Carolina, Blythewood SC customer reviews for Archadeck of Central SC, Central SC deck builder, Central SC porch builder, Columbia SC customer reviews for Archadeck of Central SC, Columbia SC Deck Builder, Columbia SC Porch Builder, Finding the right outdoor living contractor in Central SC, Finding the right outdoor living contractor in Columbia SC, Irmo SC customer reviews for Archadeck of Central SC, Lexington SC customer reviews for Archadeck of Central SC, Reviews for Archadeck of Central SC, The importance of customer feedback on July 21, 2014 by archadeckofcentralsc.